October | 2013 | Life, Music and the Web… Revived! Such is life, really. All living things should one day face death as a consequence of being a mortal. In Ziggy’s case it was damn to early. 8 days shy of his 7th month. Time flew fast, really fast. Ziggy looked like an adult dog already and i often neglect the fact that he was still a very young puppy. I treated him already like a grown up dog because he looked like one and certainly looked bigger than our local dogs here. Ziggy is technically my first puppy. I might have puppies back when i was young but I never remembered really owning or claiming a dog, maybe then they were like the family guard dogs and not someone’s pet. 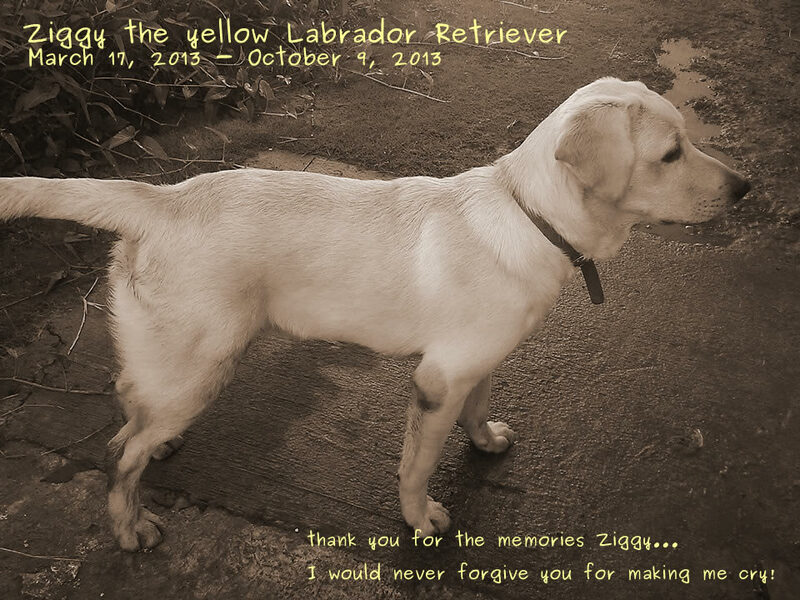 I can still remember how Ziggy arrived to us, he was a small, cute and sad looking confused little pup skimping through our then unscathed yard. Yeah our yard didn’t have dug out holes or urine stains before he arrived. It still make’s me laugh thinking how he was this destructive little machine. This entry was posted in Family on October 10, 2013 by Marco.